Did I really just even suggest something that involves the washing machine! I have this grand idea that I am going to cloth diaper. At first I thought I would save money be doing so, but after realizing that there are no cute boy clothes to shop for (or limited clothes), I have been spending my time obsessing over cute diapers. Although it is easy to get wrapped up in diaper color and pattern choices, there is a lot more important choices to make before even getting to that. The first choice you have to make is what type of diapers. Seems a bit odd, what type of diaper? I mean didn’t I just make a choice to cloth diaper. Oh no. It is not that simple. 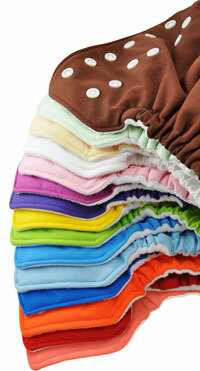 You then have to choose what type of cloth diaper. And of course then what type of cloth diaper will work/fit your baby. Of course this is the hardest part for an expecting Mom that wants everything ready and perfect for the little ones arrival. All-in-Ones: These diapers are the closest to disposable. Basically it is a waterproof cover, and the absorbent cloth that are permanently connected as one piece. In other words– you put the diaper on, you take the diaper off, you put the whole thing in the wash. Rumparooz Lil Joey is a good example of all-in-ones. Pocket Diapers: This consists of a cover material, and inside cloth material that creates a pocket, that you stuff with an absorbent insert. FuzziBunz is a good example of pocket diapers. Fitted: These look like regular diapers, that are made of an absorbent material without a protective cover. You will need to buy a protective cover to fit over these. Kissaluvs is a good example of fitted diapers. Prefolds: This is fabric that has three parts with the middle being the thick and absorbent. You can use diaper pins, snappies, or insert into diaper covers. Very economical. The come in various sizes to fit your baby as they grow. Contours: Absorbent material cut to fit your baby’s body easier. Use with snappies or insert into diaper covers. Hybrid diapers. This means that the diaper can hold disposable inserts, as well as the reusable inserts. Most waterproof diaper covers can and will do this, but there are specific companies that sell hybrid diaper systems. GroVia is a good example of hybrid diapers. The second choice you have to make is when do you plan to start cloth. Everyone says that you don’t want to bother the first week or two. With the nasty newborn poo and just being tired, that seems like a pretty good choice. But after that, do you start when they are still considered a newborn or wait until they will fit a larger size diaper. One-Size: This diaper will grow with your child and is said that you can use these till the child potty trains. Can not usually start these till they are around 10-12 pounds, or typically around 2 months of age. Fitted/ Perfect Size: This means that you will buy sizes that will be fitted, but will have to purchase more as the child grows. Size for each diaper maker is very different so look at the weight and the thigh, and rise sizing. But to give you and idea a newborn diaper size would be extra small, which would cover them from around 5 lbs to 12 lbs.